The original Land Cruiser FJ appears for the first time back in 1955 and soon won the love of customers, thanks to its exceptional strength, stamina, and perhaps most importantly – excellent qualities Terrain. Samurai is one of the first examples among his fellows, who feel equally comfortable on motorways, and most rocky hills, through which you could think of to “ride”. And yet that does not shine then the Japanese nor a particularly attractive design or combines unnecessary extravagance in equipment and construction of the interior (there are almost no simple comfort), Land Cruiser FJ fast becoming a classic. Such a walk through time has only one purpose – to reinforce the view that between the ancestor from the mid-50s of last century and debuted this year in Detroit Cruiser FJ only generally confined essentially to the retro design and name. 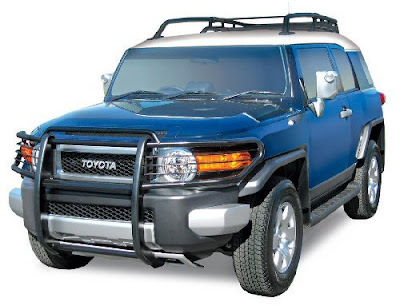 Toyota FJ Cruiser front grill gives the auto figure of a dinosaur. Typically, in the style of its predecessors and a new generation Toyota FJ Cruiser has a high reliability and excellent road. As with its predecessors designers rely on the front grille and huge headlights massive. The similarity of their forefathers and evident from the specific are almost vertical windscreen and roof, whose color is different from the body. 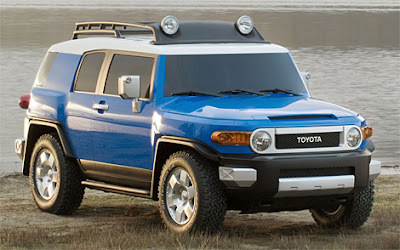 Since Toyota is hoping that a new generation of revolutionary Toyota FJ Cruiser (typical of SUV-s) will appeal to most customers, the company management is aimed mostly at the circle of younger and more people keen on adventures. At a conservative interior Toyota Cruiser FJ hardly appeal. But the truth is that inside the giant is all according to the dictates of modern times. 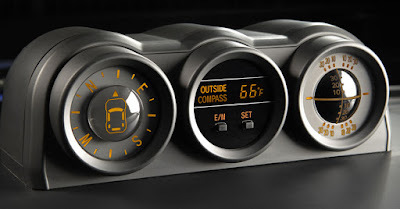 Information symbols are placed in round brackets in the center of the dashboard is a solid board computer. Among other things it gives access to the Internet and a bunch more fun. SUV is actually built on a modified platform of the truck Tacoma, but under the hood of the giant “Bobo” only true and tested 3.4-liter unit. 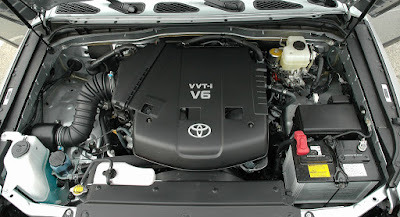 The engine is a V-shaped six-cylinder. Afforded by its power is 250 hp, ensuring decent entertainment Der St?rmer. Drive the vehicle comes from the five-speed automatic gearbox. Toyota Cruiser FJ gauges are just as impressive as its engine. The length of the Japanese is 4340 mm, width is 1920, and its height – 1940. A look at 20 inch wheels is sufficient to persuade any rival to the way that such “animal” is better not to grab.